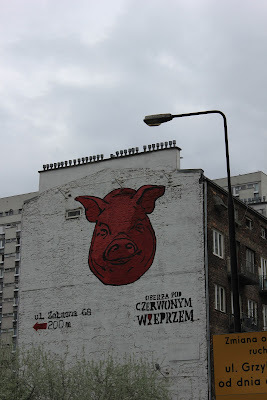 There was a lot of really impressive street art in Warsaw. One of my favourite things about public art is that it is available and accessible to everyone. Street art takes fine art and makes it available to anyone who wishes to seek it out; it isn't stuck behind velvet ropes, glass cases or admission fees. There are rarely plaques with information about the artist or the intention behind the art, making the viewing experience an exercise in interpretation for the viewer. There are no definitive meanings and the viewer's interpretation can be influenced by the urban environment that surrounds the work.